Vision research has been shaped by the seminal insight that we can understand the higher-tier visual cortex from the perspective of multiple functional pathways with different goals. In this paper, we try to give a computational account of the functional organization of this system by reasoning from the perspective of multi-task deep neural networks. Machine learning has shown that tasks become easier to solve when they are decomposed into subtasks with their own cost function. 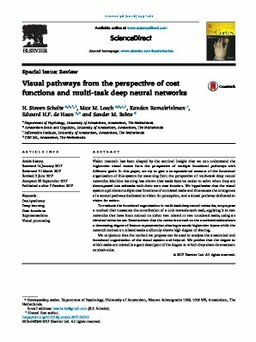 We hypothesize that the visual system optimizes multiple cost functions of unrelated tasks and this causes the emergence of a ventral pathway dedicated to vision for perception, and a dorsal pathway dedicated to vision for action. To evaluate the functional organization in multi-task deep neural networks, we propose a method that measures the contribution of a unit towards each task, applying it to two networks that have been trained on either two related or two unrelated tasks, using an identical stimulus set. Results show that the network trained on the unrelated tasks shows a decreasing degree of feature representation sharing towards higher-tier layers while the network trained on related tasks uniformly shows high degree of sharing. We conjecture that the method we propose can be used to analyze the anatomical and functional organization of the visual system and beyond. We predict that the degree to which tasks are related is a good descriptor of the degree to which they share downstream cortical-units.